Millennials Are Ruining the World! 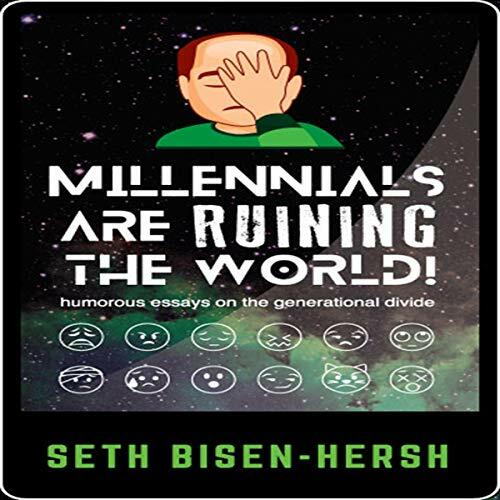 Seth Bisen-Hersh’s third book Millennials Are Ruining the World! features 24 humorous essays on the generational divide. Topics include railing against millennials’ solipsistic entitlement, their lack of responsibility and reliability, and their outsized, outrageous outraging. Essays also digress to discuss disturbing technological changes, meditation, Seth’s guide to a healthy relationship, reflections on nearing 40, gratefulness, and more! Additionally, Seth’s cat, Smee, pens his second cat-pter pontificating on how cats are better than millennials. Perfect for all generations - whether they like it or not. I love this book, and not only because I am referenced several times throughout. The author, Seth Bisen-Hersh, has a very unique way of crafting his sentences even when talking about how much he hates things. I appreciate the humor in this book; the jokes sometimes come completely out of left field, in the best way. I really enjoyed listening to this book in the car as I drove— it made sitting in traffic FAR more bearable! Excellent job, Seth. Consider it millennial-approved. It was difficult for me to get into this book at all. I am not sure I got the humor. It might help if the author had a professional reader. Narration was difficult for me to listen to.